I have recently learned about a day camp for children with special needs. I am very concerned about it because the parents who might send their children to this might think that it was safe. I think that is the furthest from the truth. Yvonne Perry, creator of the “We are 1 in Spirit” blog and self-published author of books about being a host to “walk-in” entities, is holding a “Special Needs Children’s Day Camp” Monday July 10 through Wednesday July 12. It is being held at a retreat center that she bought. She won’t even give out the address until you pay for the day camp. There is no oversight or supervision to this. There is no agency that is sponsoring this, no system of checks and balances. Would you trust your child, especially one with special needs, to this person? Look into her eyes. What do they tell you about her? She talks openly about being a host to “walk-in” entities. She says that she has been taken over by multiple different personalities and spirits. In the medical world, this is called “multiple personality disorder”. In the spiritual world, this is called “possession”. Either way, I wouldn’t think this is a person who should be left alone with children who would have a lower level of ability to communicate their needs. Special-needs children are even more vulnerable that other children. So how much for all of this? For three days (8 am to 5 pm) of leaving your child alone with someone who is not trained, not licensed, not an authority in anything at all … $150. But is this true? All we have to go on is the words in the ad. What is a “shaman-ka”? She made this up. Along with everything else. “Sham” is more like it. Be sure to read between the lines and notice that she charges people to “heal” them with her “light-language” (random non-language mutterings that she describes as speaking in tongues) as well as her “sound therapy” (singing random notes at people). She is unlicensed, untrained, and unsupervised. She has no certification in anything she does. And yet she thinks that she can charge people for her “talents”. Would you hire an electrician to rewire your house without making sure he was trained and licensed first? No. Would you allow a person to teach (or even babysit) your child if they were not certified to do so? No. Then why would anyone pay this woman to “heal” them – or worse, leave their children alone with them? I said nothing when she began her “healing” services over a year ago. Adults have to make their own decisions about what they do with their lives. But I have to speak up when she starts thinking it is OK to say she is qualified to teach children – and special-needs children (who are more vulnerable). She has written many books, and people might think that this means she has been reviewed by other experts in the field. Most authors submit their work to a publishing company who checks out their work to see if it is accurate before they will publish it. However, she skipped that step and self-publishes. Therefore, she has no oversight. Full disclosure – I wrote something for her that became part of her “light language” book. This was before she decided to charge people for her services. I am in agreement that people need to re-connect with the Holy Spirit in whatever way possible, but I disagree with charging money for it. Sam never felt comfortable looking people in the eye. He’d look away to the side or at his feet rather than make direct eye contact. It was too personal, too painful, like the mixing of a raw nerve in a tooth and a bit of soft bread. Out in public, his shoulders would curve inwards, trying to curl him into a ball like one of the hedgehogs he would see in his back yard. It was all about protecting the sensitive bits, for both of them. Sam wished he had spikes like they did for his first few years of life. Everything was too close, too loud, too much. It was only when he received a camera for his sixth birthday that he began to feel normal, or as normal as he thought he should. How should he know that his senses were aberrant? It was all he knew. Abnormal was his normal, and that was all there was to it. He thought it was normal to feel like ice was in his stomach and fire in his throat every time he had to experience something different from his usual routine. He thought it was normal to feel faint from fear or anxiety for the majority of the day. That all changed when he got the camera. The film was a 110 cartridge – easy enough for a child to install. The buttons were large and simple to use. Sam’s father thought it would help him express himself, but he had no idea how helpful it was truly was. Sam was wary of it at first, as he was of all new things, but he liked the shiny brown case and all the accessories that came with it, so soon he was using it. The strap was fun to adjust and the flash cube was enticing with its shape and sparkle. He first took pictures by holding the camera out at arm’s length, not wanting to put this new thing so close to his face. After the first batch of pictures came back from the developer, his father strongly suggested he try holding the camera up to his eyes. There were simply too many wasted pictures the other way. Something strange happened when Sam finally overcame his reluctance to put the camera to his face. Suddenly he realized he could see through the viewfinder, just as if it was a mask. He then realized that just like a mask, he was hidden from view. Suddenly his whole world opened up. Sam started taking pictures of everything and everyone. Suddenly he had a reason to go outside and be around other people. Family gatherings no longer overwhelmed him as much as before. Sure, there was still some awkwardness. That would always be there. But now he had a way to be around people that he never had before. It was like finally getting a key to unlock doors that had always been barred to him. 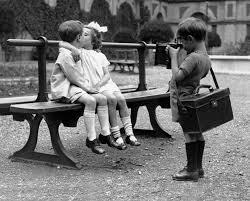 His father hoped that Sam would become a famous photographer, but Sam had no such ambitions. Fame was never something he wanted, at least the kind of fame he was aware of. If he could become famous without even knowing about it, then he was okay with that. He could barely handle normal human interactions. The idea of having random strangers coming up to him on the street or in the grocery store to get his autograph was enough to send him running to his room to grab his trusted teddy bear. Fame was overrated, after all. It just meant that people were impressed that you were the best version of you there was. Meanwhile, they spent so much time focused on your achievements that they forgot to work on their own. They got jealous sometimes, forgetting that there was enough success to go around. Rob had stopped writing actual maps in his notebook after the second time he’d gotten caught. The police had confiscated his satchel along with his notebook and figured out too much from it. If he’d just had the usual things in notebooks – poems, stories, a few sketches, then they might’ve let him go, thinking he was a student of a sort. That alone could have spelled trouble because schools had ceased to be in the years after the Disappearances. But it wasn’t uncommon for people in their early 20s to cobble together some kind of curriculum for themselves. The police didn’t mind that, seeing it as a harmless way to spend their time. They knew it wouldn’t, it couldn’t, lead to anything. But if they suspected his notes were about Walks then the whole plan could have unraveled overnight. The police couldn’t go on Walks, of course. If they could, they would. Who wouldn’t? The ability to travel from Room to Room, discovering new buildings from the inside was quite a feat. It was like having a master key to every house. “Open house” events took on a whole new meaning if you were a Visitor. The problem was, some Visitors worked for the police. Not willingly, mind you. The only “pay” they got was being set free. They’d been caught on a Walk, often helping themselves to something in a member of the Quality’s house. Visitors didn’t think of it as stealing, but the Quality sure did, and the police were notified. How can it be stealing when the items weren’t even bought by the Quality? The concept of “possession is 9/10 of the law” still held true even in this time, because the people who did all possessing had all the lawyers on their side. Hell, half of the Quality were lawyers, those that hadn’t had time to settle down and start a family. Visitors who were caught had two choices if they wanted to go free. Pay a fine or rat out another Visitor, which sometimes meant decoding their maps so the police would know where to catch them. It wasn’t much of a choice because most Visitors didn’t have enough money to make the police happy. Too little and they couldn’t pay. Too much and they were liable to face yet more charges, including burglary or robbery. It was seemingly easier to be a snitch. But it also carried a penalty. Snitches didn’t tend to last long. Once word got out among the Visitors, a snitch would often get shoved into a Room whose closest Door was at least 100 miles away. Those kinds of Rooms were why Visitors made maps. Some things were too unpleasant to want to have to do again. They’d exchange information whenever they could about Doors that were useful and ones that were less than. Someone else’s misfortune didn’t have to be yours. Rob had decided on his own to transform his maps into sketches of leaves and flowers. This way it looked like he was going on nature walks rather than going on Walks. A darkened bit of leaf here, an apparently inchworm chewed bit there, and nobody was the wiser. His marks made sense to him, and that was what mattered. He used actual plants as his basis for the sketches to have verisimilitude. He didn’t have a good enough imagination so he didn’t try to make them up. His Gran had taught him quite a bit about plants, albeit unintentionally. He was her garden helper and had to know what was weed and what was vegetable. He thought of it as slave labor at the time, but he was grateful for it now. His leaf maps were starting to make more sense. Now that he’d had time to compare notes with Mickey and Julia, some of the missing areas were filling in nicely. There still were areas that didn’t appear to have any Doors at all. He compared these areas against a large topographic map of the state at the local library. He and Julia agreed that more and more evidence pointed towards the problem starting with all three areas called Rayon City, and it didn’t take long for the two of them to convince Mickey that they were on to something. The three Rayon Cities were built hundreds of years ago by a chemical corporation to house their employees. The cities, more like large villages, were built in short order along with the plant. It was an added incentive to have a ready-made place to live for young impressionable potential employee. The same people who were drafted to go overseas to fight the Germans were the same kinds of ones who took up jobs in that labyrinthine, windowless complex of a plant. Both groups barely out of high school and with no marketable skills other than day labor. Both groups were average (or worse) students. Both groups were from poor families. They didn’t have many choices. The military or the plant was the same as far as a choice went. They both paid well, had good benefits, and were dangerous. People took their chances going to work for either of them. With the military, you could die or come back missing a limb or your mind. Death or dismemberment wasn’t a great risk with the plant, but mental illness couldn’t be ruled out. Cancer was a strong contender, too. Both groups thought of themselves as lucky, as above average when it came to the odds. In short, they didn’t think the bad stuff could happen to them. Something bad happened, but not what anyone could have expected. All those years of “not me” Pollyanna optimism, all that time being surprised when the bad stuff actually did happen, all those people who cheated themselves out of their own future by borrowing against it with wishful thinking – it all mixed together somehow with the secret experiments that were going on at the plant. The three plants were privately run but government controlled. It was a weird sort of marriage that had happened before. It had begun with the post office and ended with the auto manufacturers. It was an experiment that resulted in an odd hybrid of the two – good benefits from the government side, better management from the private industry side. It wasn’t perfect, however. Employees had to commit an actual crime to be fired. Plenty of people who would never have gotten hired in private industry got to not only keep their jobs but often got promoted. It seemed like the more inept you were, the more you got paid. Another feature of this corporate chimera was the secrecy. Regular private businesses were supposed to be transparent. The government was as transparent as a brick wall. Even the Freedom of Information Act couldn’t be used to pry open the company’s files on its less-than-normal experiments. It wouldn’t have mattered anyway even if someone had tried. They didn’t write any of this experiment down. It was too important to risk being exposed. The company had divided all of the workers into tiny groups that never spoke with each other. Sometimes the left hand didn’t even know the right hand existed. Each workgroup had its assigned task and were told nothing about how it related to the whole. At first they were told it was for the benefit of national security. The company made a lot of material for the war effort. They were involved in anything that involved chemicals. Rayon, that miracle fiber that was invented in their laboratory, was used in making parachute cord. Chemicals normally used in fertilizer were instead used to make bombs. The workers understood the need for secrecy – the less they knew, the less chance of the wrong information getting into enemy hands. The war was long over but the secrets continued. It had become habit to not ask questions, become a matter of fact that you just didn’t even think about what other groups did, even those that shared your area. The metaphorical cat wasn’t even curious, so he stayed alive and safe. I know a lady who has a son who appears to have a case of Asperger’s. She refuses to even consider the idea. She just thinks that he is annoying and needs to be told to be quiet. She and his stepfather have noticed that all of his friends are younger than he is, and he has a hard time fitting in. He will talk endlessly about his own interests and not know how to interact with other people in a meaningful way. He acts a lot younger than he is and it is very difficult to be around him. They think they are doing him a favor by letting him be around their adult friends. They don’t get that it isn’t a favor to their friends. I’ve spoken with her often about him. She believes that to take him to get assessed or get treatment is to say that there is something wrong with him. She doesn’t want the stigma of a developmental disorder attached to him. She’d rather him suffer, and for everyone around him to suffer, than for him to get help. Think of it this way. What if he had vision problems? Rather than admitting that he has low vision, she’d rather let him bump into everything and get hurt. When he got older, he’d try to drive and cause accidents because he can’t see properly. Asperger’s is like social blindness. He bumps into people. He bumps into social rules. Getting treatment for him would be the same as getting glasses. In fact it would be better than getting glasses because people see you wearing glasses. There is a stigma there. It is obvious. Getting treatment for Asperger’s is even better than wearing glasses. If he has counseling to learn how to interact with other people in a healthy way, then the only thing people will notice is that he’s not bumping into people anymore. How much of Asperger’s is a disease and how much is a description of behavior? How about we turn it around, and say that all people who are rigid about rules and have a hard time changing have Asperger’s, rather than all people who have Asperger’s are rigid about rules and have a hard time changing. It is like a personality disorder. All people who act in this certain way have X disorder, but really it isn’t a disorder. It isn’t a disease that has a medical cause. It is a maladaption or a lack of training. What if we said all people who spend their free time watching game shows have a disorder? Or all people who have to buy the latest fashions even though they can’t afford them have a disorder? Or those who cheat on their wives or taxes have a disorder, or those who steal office supplies or drive 20 miles over the speed limit have a disorder? Saying it is a disorder takes people off the hook. It means they are not responsible. It is something that happened to them. They are passive agents. Like the flu or chickenpox, it is a disease that they suffer with rather than a personality trait they can (and should) change. It might require a lot of therapy and several years, but it can be done. What if the cause of Asperger’s is the cure? They had too little changes in their lives. They were allowed to insist on a rigid and predictable life. All sandwiches were peanut butter and strawberry jelly with no crust, cut diagonally. All toys had to be blue. All clothes had to be cotton. These things had to be done or else the child would have a tantrum to end all tantrums. And rather than insist the child grow and adapt, the parent gave in and the child grew up stunted like a bad bonsai tree. Then he entered the real world where nobody else was willing to accommodate him. Sometimes the rule isn’t “Do unto others as you would have them do unto you.” Sometimes the best way to interact with a person is to imitate how they are interacting with you. Imagine this – if they are working on the premise of “do unto others…” then how they are interacting with you is exactly how they would like to be treated. So if your way doesn’t work, try their way. If they stand too close, try standing close to them when you initiate a conversation. If they only talk standing up, try that. It may make you feel uncomfortable, but it may help them feel comfortable. If you keep communicating with them your way and not their way, they may feel like something is wrong. These unwritten rules of social interaction are often what make or break a conversation. Just like different cultures have different conversational styles, so do different people. To make someone feel comfortable, try doing things their way – not yours. Often, it isn’t what is said, so much as how it is said that makes the conversation work or not.